The Kydex Wallet is our everyday carry solution to credit card, business card and money organization. It's slimmer, lighter, and more durable than a traditional leather wallet. The light, durable Kydex material and slim design allows the user to carry the wallet in the front pocket, which is far more comfortable than carrying in the back pocket. The middle thumb groove allows the user to conveniently slide credit and business cards out of the front of the wallet. The durable silicone strap helps keep the cards and wallet organized and serves as a money strap. Fits 10-12 Credit Cards and 5 Business Cards comfortably. 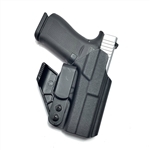 A lightweight, ambidextrous, minimalist kydex holster designed specifically for IWB / A/IWB Concealed Carry. The NeoMag is a minimalistic back-up magazine holder that inconspicuously clips inside your pocket. Three sizes: Small, Medium and Large. A lightweight, minimalist kydex holster designed specifically for IWB or Appendix Concealed Carry of the Glock 19 or 17 with Inforce APLc weaponlight. A lightweight, minimalist kydex holster designed specifically for IWB or Appendix Concealed Carry of the CZ P10c with Inforce APLc weaponlight.